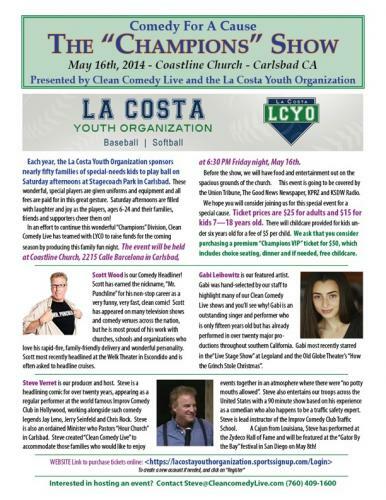 Each year the La Costa Youth Organization’s Champions League, a not-for-profit organization, spends about $10,000 in order to provide special needs children the chance to play baseball/softball. To help offset those costs, the Champions League will be hosting a comedy night fundraiser at Coastline Church on May 16th, 6:30pm. This years acts will include: Steve Verret, Gabi Leibowitz and Scott Wood. For more information check out Clean Comedy’s Website here or call (760) 409-1600. When you are ready you can sign up Online. Tickets are $50 per adult and $15 per child. Enjoy a nice evening out and feel good supporting special needs children and the LCYO’s Champions!